.... as you tool a beautiful new bit of leather craft! Have you ever admired the intricate carvings of a leather work artist? Even wished you could do such a thing? But life got in the way and you just never got around to it? Well, now that you're RV Boondocking, you sure have the time! At least when you aren't out fishing, kayaking or hiking! And Let's face it. If you're out running around all the time you're either gonna run out of dinero for fuel or "steam" or both! Carving leather is a perfect activity for those rainy days or when you just want to spend a quiet afternoon in camp recharging your batteries. What if I told you "Yes! You can do it!"? How the heck would I know? 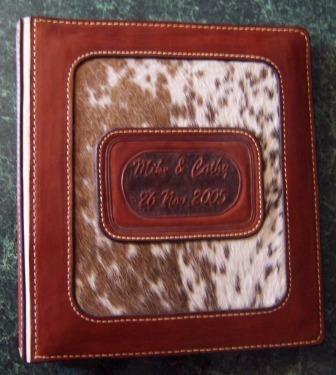 How about, I pursued leather craft for ten years or so in my own custom leather shop? I'd guess that gives me an idea of what you can do! I am currently working the kinks out of a light, portable, shop for myself. Some of my equipment is pictured here. You'll not need all I'll carry to do good work, but it will show you, that it can be done! Like a lot of things in life, that which is worth doing, usually ain't easy. 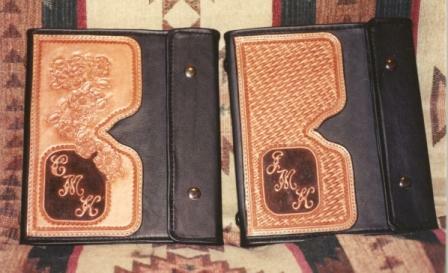 Quality leather work, is one of those "not easy" things. But, with a bit of practice, a few fairly simple tools and some good instruction, you can produce fine, well done leather craft pieces you can be proud of. Ok, you have the time to practice, and buying the few start up tools and materials you'll need isn't a problem, but where are you going to get "good instruction" in an RV Boondocking camp? Truth is, you can teach yourself ..... sort of. 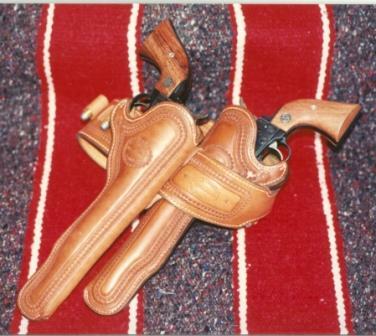 There was, for many years, a fine leathercraftsman named Al Stohlman. He passed on several years ago, and is missed in the craft. 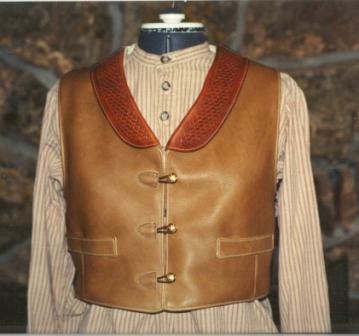 But, before he left, he and his wife Ann, herself an accomplished saddle maker, produced an enduring legacy of the best leather craft instructional books ever written. No-one has ever produced any instructional books as complete, as clearly illustrated, and as understandable, as those written by Ann and Al Stohlman. They are available at most of the better Leather Craft Stores and Catalogs. Al will take you, step by step, through every task known to leather craft. From leather tooling and leather carving to saddle making, Al will answer every question you'll come up with, usually before you think of it! He'll coax you along with an ability I've found in no-one else. You can teach yourself to work leather. 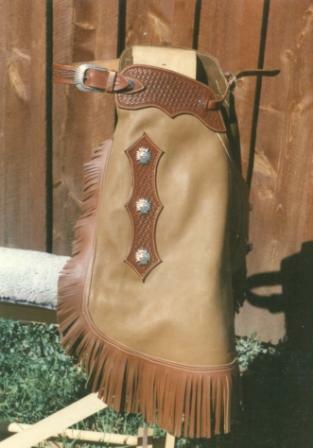 Leather tooling, leather carving, leather stitching, dyeing, finishing, all of it. You can teach yourself .... if .... you use Al Stohlmans Books! I know, because that's how I learned! I had no-one else around to learn from. 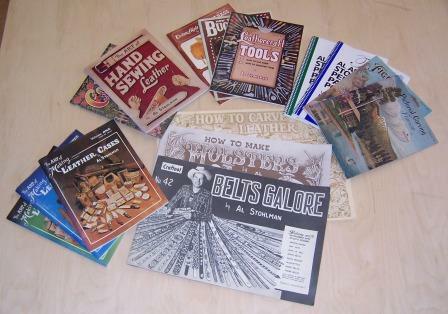 Actually, there are a good number of very good instructional leather craft books out there, but Al Stohlmans books are the cream of the crop, in my opinion. You won't need all the big machinery that you'll find in most big pro leather craft shops. Anything in leather work, done by machine, can be done by hand. The only reason we use the machinery in shops is for the increased speed you can achieve. When you're getting paid by the job, speed is a big deal! About the only "big" furniture you'll want is a stitching horse. 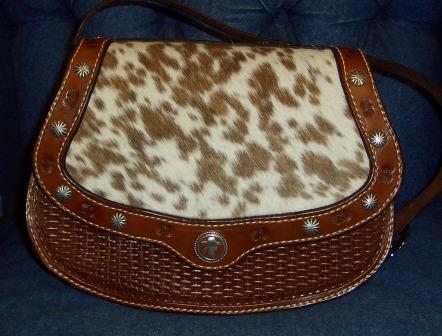 You can save a little space with that if you go with what we call a stitching "pony". 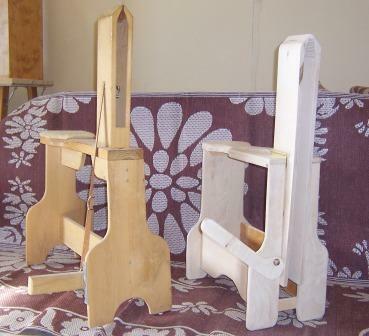 Where, with a stitching horse, you sit on a free standing piece of shop furniture, a stitching pony sits on your chair and you sit on it to hold it in place. Saves storage space. On second thought there is one other fairly sizeable piece of furniture you'll likely want. Some sort of a work bench that you can break down easily when you move camp will be indespensible! I carved a "butcher block" bench for my own use. 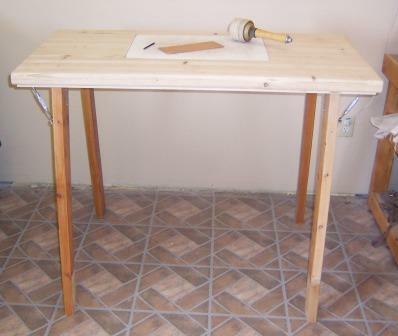 I've seen others use a lighter wooden top with a wood "skirt" that would just drop down over the top of one of the 4', folding, plastic tables fromSams club or Costco. They seem to be sturdy enough to allow you to bang on them a little bit! 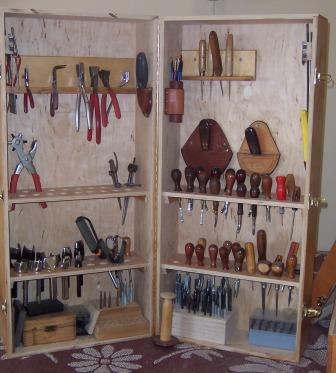 I'll be using one of those folders to hold my tool cases. 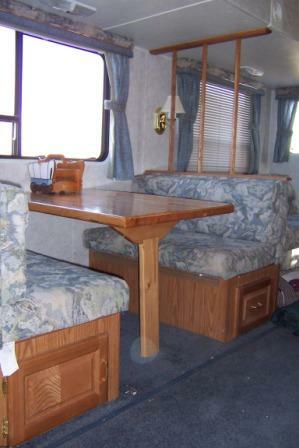 To give myself a more solid table to do my leather tooling on, I rebuilt our dinette with a butcher block surface, and a little more substantial support leg than that provided by the masonite dinette top and spindly little tube leg, that was installed in our fifth wheel at the factory. You have a couple of options for a tooling surface. The Tandy or Leather Factory supply stores sell a marble block that does a good job. 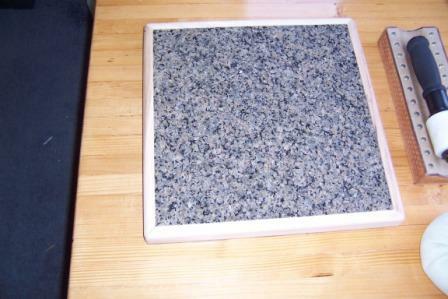 I prefer a larger surface, so I use a piece of granite. These are available from the shops that build the granite countertops, for a reasonable price, and give you a much larger surface to work on. All your small leather working hand tools, hardware and supplies, can be transported and stored in a few small tool boxes. 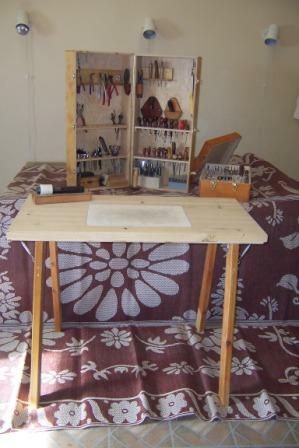 If you are at all handy and have access to a wood shop (family or friend? or your own if you maintain a brick and mortar place?) 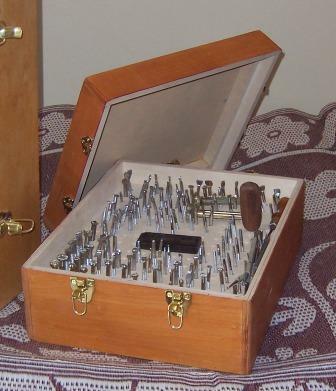 you can whittle up some or all of your leather craft tool boxes, as I've done for myself. I seem to have a habit of thinking bigger is better .......... except with our fiver! So now I have "Bigger is Better" tool boxes squeezed into a "smaller is better Fifth Wheel" ............ Hmmm. Maybe Heidi is right, I must just like making things more difficult then they need to be! If you've never been there, I can tell you, sitting on your stitching horse, with your favorite music singin' along on the stereo, as you go through the rythmical motions of stitching up the finely carved album you're building, is a nearly magical time. When I've really had it with the world, a couple hours tooling or carving a new panel, or stitching a nearly finshed project together, can really put my head back in the right place. Besides being a great way to feed my creative hungers it's a pretty good therapy for a sometimes cranky Ol' Geezer! Stop by the nearest leather craft supply and give it a try! If you run into a difficulty, drop me a line, I'll see if I can get you pointed in the right direction.